Turkic migration refers to the expansion of the Turkic tribes and Turkic languages into Central Asia, Eastern Europe and West Asia, mainly between the 6th and 11th centuries. The region of origin of the Turkic peoples is suggested to be somewhere in Siberia (North Asia), Mongolia or northwestern Manchuria. Identified Turkic tribes were known by the 6th century, and by the 10th century most of Central Asia was settled by Turkic tribes. The Seljuq dynasty settled in Anatolia starting in the 11th century, ultimately resulting in permanent Turkic settlement and presence there. Meanwhile, other Turkic tribes either ultimately formed independent nations, such as Kyrgyzstan, Turkmenistan, Uzbekistan and Kazakhstan, and others new enclaves within other nations, such as Chuvashia, Bashkortostan, Tatarstan, the Crimean Tatars, the Uyghurs in China, and the Sakha Republic Siberia. The earliest documented Turkic peoples appear as nomadic tribes on the plains of the Far East north of the Great Wall of China, which was constructed as a fortified border essentially between Han dynasty (206 BCE-220 CE) China (though started earlier) and the Xiongnu. Some theories suggest that the proto-Turkic people lived somewhere in modern Manchuria as agriculturalists and later adopted a nomadic lifestyle and started a migration to the west. Genetic studies about early Turkic samples also suggest an origin in Northeast Asia. The population ancestral to the Turks is thought to have included the Xiongnu of Mongolia or along the upper Yenisei in Siberia (the area of the contemporary Tuvan language), known from historical sources. The Han chronicle of the Xiongnu, included in the Records of the Grand Historian of the second century BCE, traces a legendary history of them back a thousand years before the Han to a legendary ancestor, Chunwei, a supposed descendant of the Chinese rulers of the Xia dynasty (c. 2070 – c. 1600 BCE). Chunwei lived among the "Mountain Barbarians" Xianyun or Hunzhu. Xianyun and Hunzhu's names may connect them to the Turkic people, who later were said[by whom?] to have been iron-workers and to have kept a national shrine in a mountain cave in Mongolia. Apparently the Xiongnu comprised a number of tribes and geographic groups, not all of which were probably Turkic (considering the later mixed ethnicity). The Records of the Grand Historian mention the Mianshu, Hunrong and Diyuan west of Long; the Yiqu, Dali, Wiezhi and Quyan north of the Qi and Liang mountains and Jing and Qi Rivers; the Forest Barbarians and Loufan north of Jin and the Eastern Barbarians and Mountain Barbarians north of Yan. Later the treatise mentions others. There were apparently many of the latter. At the end of the Xia, about 1569 BCE by the reckoning of the Records of the Grand Historian, the Chinese founded a city, Bin, among the Rong tribe of barbarians. In 1269 the Rong and the Di forced the relocation of Bin. About 1169 BCE the Quanyishi tribe was attacked by the Zhou Dynasty, which in 1159 forced all the barbarians into "the submissive wastes" north of the Jing and Luo Rivers. In 969 BCE "King Mu attacked the Quanrong and brought back with him four white wolves and four white deer ...." The early Turkic peoples believed that shamans could shape-shift into wolves. In 769 Marquis Shen of the Zhou enlisted the assistance of the Quanrong in rebelling against the emperor You. The barbarians did not then withdraw but took Jiaohuo between the Jing and Wei Rivers and from there went marauding into central China, but were driven out. In 704 the Mountain Barbarians marauded through Yan, and in 660 BC attacked the Zhou emperor Xiang in Luo. He had discarded a barbarian queen. The barbarians put another on the throne. They went on plundering until driven out in 656 BC. Subsequently the Chinese drove out the Di and subordinated all the Xiongnu (temporarily at least). Around 456 BC the Chinese took Dai from them. The Yiqu tribe tried building fortifications but lost them to the Chinese in this period of their expansion. Here the detail of the narrative increases as it deals with the rise of the Qin Dynasty of 221-206 BCE, which is no doubt mainly historical rather than legendary. The Qin kept the Xiongnu at bay. Early anthropometric and genetic studies have not provided a conclusive answers about the "race" of proto-Turkic people. DNA analyses find affinities to West Eurasian populations in the west, North East Asian populations in the east, and a mixture of both on a gradient in-between. Newer studies suggest a clearly mongoloid origin for the proto-Turkic people. During and after the migration into Central-Asia, these tribes mixed partially with Indo-European nomads. Concerning the cultural genesis of the Huns, the Cambridge Ancient History of China asserts: "Beginning in about the eighth century BC, throughout inner Asia horse-riding pastoral communities appeared, giving origin to warrior societies." These were part of a larger belt of "equestrian pastoral peoples" stretching from the Black Sea to Mongolia, and known to the Greeks as the Scythians. 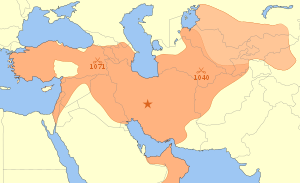 The Scythians in the west were Iranian, speaking one among very many languages ultimately descended from Proto-Indo-European, whose speakers themselves are also hypothesised to have occupied the Pontic-Caspian Steppe, according to the leading theory of Indo-European origins, the Kurgan model. The communities of the northern belt north of China, a historically Inner Mongolia region were the Proto-Xiongnu. Qin's campaign against the Xiongnu of 215 BCE kept the Xiongnu at bay, driving them out of and seizing the Ordos region. Problems re-emerged after the Qin Dynasty. The Xiong-nu attacked Shanxi of the Han in 201 BCE. Emperor Gaozu of Han bought them off with jade, silk and a Chinese wife for the Shanyu, or leader. Relations with the Xiongnu continued to be troubled and in 133 BC Emperor Wu of Han proceeded against them with 300,000 men. Eighty-one years and fourteen expeditions later in 52 BC the southern Xiongnu surrendered and the northern desisted from raiding. The Han Dynasty military expeditions continued near the frontier of China, in the Han–Xiongnu War, and in 89 AD the Xiongnu state was defeated and soon ended. One especially severe round of nomadic rebellion in the early 4th century has led to the certain identification of the Xiongnu with the Huns. A letter (Letter II) written in the ancient Sogdian language excavated from a Han Dynasty watchtower in 1911 identified the perpetrators of these events as the xwn, "Huns", supporting de Guignes' 1758 identification. The equivalence was not without its critics, notably Otto J. Maenchen-Helfen, who argued that xwn was a general name and could refer to anyone. More recently other evidence was noticed: Zhu Fahu, a monk, translated Sanskrit Hūṇa in the Tathāgataguhya Sūtra and in the Lalitavistara Sūtra as "Xiongnu". Vaissière reconstructs the pronunciation as *Xiwong nuo. Moreover, the Book of Wei states that the king of the Xiongnu killed the king of Sogdia and took the country, an event is datable to the time of the Huns, who did exactly that; in short, "... the name of the Huns is a precise referent and not generic." The Hunnic Empire of about AD 450 as seen by European authors. The star marks where the nomadic Huns chose to encamp, the Hungarian plain, a sort of enclave of steppe country in a mountainous region. While their actual identity is still debated, the Huns have often been considered a Turkic people, and sometimes associated with the Xiongnu. Orosius has the Huns riding down upon the Ostrogoths in the year AD 377 totally by surprise, "long shut off by inaccessible mountains" and apparently of hitherto unsuspected existence. Whatever may have been his reasons for making such a statement, he and Goths might have found ample reference to the Huns in the classical geographers, such as Pliny and Ptolemy; in fact, some were already in Europe. The mountains were mythical as the Ostrogoths were located on the Pontic steppe, an easy target for Hunnic cavalry. While in Europe they incorporated others, such as Goths, Slavs, and Alans. The Huns were not literate (according to Procopius) and left nothing linguistic with which to identify them except their names, which derive from Germanic, Iranian, Turkic, unknown and a mixture. Some, such as Ultinčur and Alpilčur, are like Turkish names ending in -čor, Pecheneg names in -tzour and Kirghiz names in -čoro. Names ending in -gur, such as Utigur and Onogur, and -gir, such as Ultingir, are like Turkish names of the same endings. One tribe of the Huns called themselves the Acatir (Greek Akatiroi, Latin Acatiri), which Wilhelm Tomaschek derived from Agac-ari, "forest men", reminiscent of the "Forest Barbarians" of the Shi-Ji. The Agaj-eri are mentioned in an AD 1245 Turko-Arabian Dictionary. The name Agac-eri occurred in later history in Anatolia and Khuzistan (e.g. city of Aghajari). Maenchen-Helfen rejects this etymology on the grounds that g is not k and there appears to be no linguistic rule to make the connection. Herodotus, however, mentions the Agathyrsi, whom Latham connects with some early Acatiri in Dacia. Jordanes places the "most mighty race of the Acatziri, ignorant of agriculture, which lives upon its herds and upon hunting" south of the Aesti (in part Prussians). A number of sources identify the Bulgars with the Huns. Another branch were the Saviri, or Sabir people. 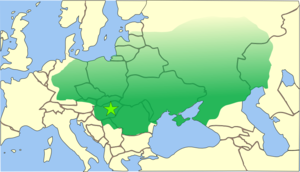 The strongest candidate for a remnant of the speakers of the Hunnic language are the Chuvash, who are on or near the location of the Volga Bulgars. The end of the Huns as a Eurasian political unity is not known. A token end point for the Huns of the west, perhaps all the Huns, is the fixation of the head of Dengizich, a son of Attila, on a pole at Constantinople in 469. He had been defeated in Thrace in that year by Anagastes, a Gothic general in the service of the Roman Empire. Various peoples continued to call themselves Huns even though acting autonomously, such as the Sabir people. 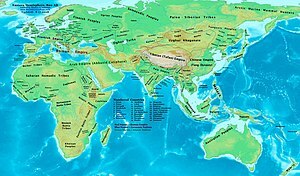 According to the Cambridge History of Early Inner Asia, the last state to call itself Hunnic was the Caucasian Kingdom of the Huns, visited in 682 by an Albanian bishop. Many of these peoples were Turkic but meanwhile other coalitions leading to explicitly named Turkic empires had been forming on the original range of the Xiong-nu. Their expansion has been conventionally called the "Turkic migration" but in fact the Turkics had already been "migrating" for some centuries. However, the Chinese name "tie-le", corresponding to "Türük", was used much earlier, around the period when the Mongolic tribes Tuoba and Rouran vied for hegemony over the Mongolian steppes around the 5th and 6th centuries. The term Türk or Türküt, corresponding to the Chinese name tu-jue, was first used as an endonym in the Orkhon inscriptions of the Göktürks (English: 'Celestial Turks') of Central Asia. The first reference to "Turks" (Tujue) appears in Chinese sources of the 6th century. The earliest evidence of Turkic languages as a separate group comes from the Orkhon inscriptions of the early 8th century. The precise date of the initial expansion from the early homeland remains unknown. The first state known as "Turk", giving its name to the many states and peoples afterwards, was that of the Göktürks (gök = 'blue' or 'celestial', however in this context "gök" refers to the direction "east". Therefore, Gokturks are the Eastern Turks) in the 6th century. The head of the Ashina clan led his people from Li-jien (modern Zhelaizhai) to the Rouran seeking inclusion in their confederacy and protection from China. His tribe comprised famed metal smiths and was granted land near a mountain quarry that looked like a helmet, from which they got their name 突厥. A century later their power had increased such that they conquered the Rouruan and set about establishing a Göktürk Empire. 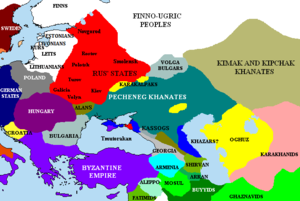 The Turkic family of languages were spoken by Bulgars, Pechenegs, Cumans, Dingling, Gaoche peoples long before the Göktürk Khanate came into prominence. Many groups speaking 'Turkic' languages never adopted the name "Turk" for their own identity. Among the peoples that came under Göktürk dominance and adopted its political culture and lingua-franca, the name "Turk" wasn't always the preferred identity. In other words, there wasn't a unified movement westward by a culture under one unified ethnic identity, such as that of the Mongol conquest of Eurasia under the Chinggisid political leadership. Rather, Turkic languages – both peripheral ones like the Bulgar branch and central ones like the Oghuz and Karluk-Chagatai branches – drifted westward by autonomous movements of diverse tribes and migrating traders, soldiers and townspeople, outnumbering and assimilating non-Turkic indigenous peoples along the way, and being partly replaced by other language families that have become prominent in the east, such as Mongolic languages on the Mongolian steppes, Indic languages in India, and Persian in post-Timurid Iran. Later Turkic peoples include the Karluks (mainly 8th century), Uyghurs, Kyrgyz, Oghuz (or Guz, Uz, Ghuzz, etc.) Turks, and Turkmens. As these peoples were founding states in the area between Mongolia and Transoxiana, they came into contact with Muslims, and most gradually adopted Islam. However, there were also some other groups of Turkic people who belonged to other religions, including Christians, Jews (see Khazars), Buddhists, and Zoroastrians. While the Karakhanid state remained in this territory until its conquest by Genghis Khan, the Turkmen group of tribes was formed around the core of westward Oghuz. The name "Turkmen" originally simply meant "I am Turk" in the language of the diverse tribes living between the Karakhanid and Samanid states. Thus, the ethnic consciousness among some, but not all Turkic tribes as "Turkmens" in the Islamic era came long after the fall of the non-Muslim Gokturk (and Eastern and Western) Khanates. The name "Turk" in the Islamic era became an identity that grouped Islamized Turkic tribes in contradistinction to Turkic tribes that were not Muslim (that mostly have been referred to as "Tatar"), such as the Nestorian Naiman (which became a major founding stock for the Muslim Kazakh nation) and Buddhist Tuvans. Thus the ethnonym "Turk" for the diverse Islamized Turkic tribes somehow served the same function as the name "Tajik" did for the diverse Iranian peoples who converted to Islam and adopted Persian as their lingua-franca. Both names first and foremost labeled Muslimness, and to a lesser extent, common language and ethnic culture. Long after the departure of the Turkmens from Transoxonia towards the Karakum and Caucasus, consciousness associated with the name "Turk" still remained, as Chagatay and Timurid period Central Asia was called "Turkestan" and the Chagatay language called "Turki", even though the people only referred to themselves as "Mughals", "Sarts", "Taranchis" and "Tajiks". This name "Turk", was not commonly used by most groups of the Kypchak branch, such as the Kazakhs, although they are closely related to the Oghuz (Turkmens) and Karluks (Karakhanids, Sarts, Uyghurs). Neither did Bulgars (Kazan Tatars, Chuvash) and non-Muslim Turkic groups (Tuvans, Yakuts, Yugurs) come close to adopting the ethnonym "Turk" in its Islamic Era sense. Among the Karakhanid period Turkmen tribes rose the Atabeg Seljuq of the Kinik tribe, whose dynasty grew into a great Islamic empire stretching from India to Anatolia. Turkic soldiers in the army of the Abbasid caliphs emerged as the de facto rulers of much of the Muslim Middle East (apart from Syria and North Africa) from the 13th century. The Oghuz and other tribes captured and dominated various countries under the leadership of the Seljuk dynasty, and eventually captured the territories of the Abbasid dynasty and the Byzantine Empire. Meanwhile, the Kyrgyz and Uyghurs were struggling with one another and with the Chinese Empire. 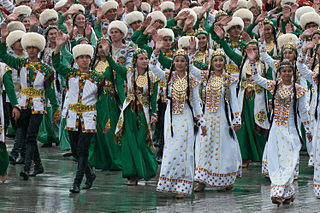 The Kyrgyz people ultimately settled in the region now referred to as Kyrgyzstan. The Batu hordes conquered the Volga Bulgars in what is today Tatarstan and Kypchaks in what is now Southern Russia, following the westward sweep of the Mongols in the 13th century. 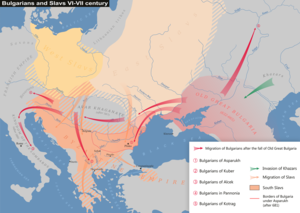 Other Bulgars settled in Europe in the 7-8th centuries, but were assimilated by the Slavs, giving the name to the Bulgarians and the Slavic Bulgarian language. It was under Seljuq suzerainty that numerous Turkmen tribes, especially those that came through the Caucasus via Azerbaijan, acquired fiefdoms (beyliks) in newly conquered areas of Anatolia, Iraq and even the Levant. Thus, the ancestors of the founding stock of the modern Turkish nation were most closely related to the Oghuz Turkmen groups that settled in the Caucasus and later became the Azerbaijani nation. land of sedentary Turkic-speaking townspeople that have been subjects of the Central Asian Chagatayids, i.e. Sarts, Central Asian Mughals, Central Asian Timurids, Uyghurs of Chinese Turkestan and the later invading Tatars that came to be known as Uzbeks; This area roughly coincides with "Khorasan" in the widest sense, plus Tarim Basin which was known as Chinese Turkestan. It is ethnically diverse, and includes homelands of non-Turkic peoples like the Tajiks, Pashtuns, Hazaras, Dungans, Dzungars. Turkic peoples of the Kypchak branch, i.e. Kazakhs and Kyrgyz, are not normally considered "Turkestanis" but are also populous (as pastoralists) in many parts of Turkestan. ^ a b "(PDF) Transeurasian theory: A case of farming/language dispersal". ResearchGate. Retrieved 2019-03-13. ^ a b Yunusbayev, Bayazit; Metspalu, Mait; Metspalu, Ene; Valeev, Albert; Litvinov, Sergei; Valiev, Ruslan; Akhmetova, Vita; Balanovska, Elena; Balanovsky, Oleg (2015-04-21). "The Genetic Legacy of the Expansion of Turkic-Speaking Nomads across Eurasia". PLoS Genetics. 11 (4): e1005068. doi:10.1371/journal.pgen.1005068. ISSN 1553-7390. PMC 4405460. PMID 25898006. ^ Sima, Qian; Burton Watson (1993). Records of the Grand Historian. Columbia University Press. pp. 129–162. ISBN 978-0-231-08166-5. ^ Khusnutdinova, E.; et al. (2002). "POSTER NO: 548: Mitochondrial DNA variety in Turkic and Uralic-speaking people". Shanghai: HGM2002. Archived from the original on 2012-02-22. ^ Di Cosmo, Nicola (1999). "The Northern Frontier in Pre-Imperial China". In Loewe, Michael; Shaughnessy, Edward L. (eds.). The Cambridge History of Ancient China: From the Origins of Civilization to 221 B.C. Cambridge University Press. p. 886. ISBN 978-0-521-47030-8. ^ Wood, Frances (2002). The Silk Road: Two Thousand years in the Heart of Asia. University of California Press. p. 50. ISBN 978-0-520-23786-5. ^ Ebrey, Patricia Buckley; Walthall, Anne; Palais, James B. (2009). East Asia: A cultural, social, and political history (2nd ed.). Boston: Houghton Mifflin. p. 40. ISBN 978-0-547-00534-8. ^ Morton, W. Scott; Charlton M. Lewis (2004). China: Its History and Culture: Fourth Edition. McGraw-Hill Professional. p. 52. ISBN 978-0-07-141279-7. ^ Morton (2004), page 55. ^ Book of Later Han, vols. 04, 19, 23, 88, 89, 90. ^ Zizhi Tongjian, vol. 47. ^ Vaissière, Etienne de la (2004). "The Rise of Sogdian Merchants and the Role of the Huns: The Historical Importance of the Sodgian Ancient Letters". In Whitfield, Susan (ed.). The Silk Road: Trade, travel, War and Faith. Translated by Hampson, Kate. Chicago: Serindia Publications Inc. pp. 22–23. ISBN 978-1-932476-12-5. ^ Orosius. "Historiarum Adversum Paganos Libri VII". Book VII Section 33.10. The Latin Library. ^ Maenchen-Helfen, Otto J. (1973). Max Knight (ed.). The World of the Huns. The University of California Press. pp. 444–455. ^ a b Maenchen-Helfen (1973) page 376. ^ Maenchen-Helfen (1973) pages 441–442. ^ Maenchen-Helfen (1973) pages 427–428. ^ Maenchen-Helfen (1973) page 437. ^ Latham, Robert Gordon (2003). The Nationalities of Europe: Volume 2. Adamant Media Corporation. p. 391. ISBN 1-4021-8765-3. ^ Maenchen-Helfen (1973) page 432. ^ Maenchen-Helfen (1973), Page 168. ^ Sinor, Denis (1990). The Cambridge History of Early Inner Asia. Cambridge University Press. p. 201. ISBN 0-521-24304-1. ^ Holcombe, Charles (2001). The Genesis of East Asia, 221 B.C.-A.D. 907. University of Hawaii Press. p. 114. ISBN 0-8248-2465-2. ^ Saso, Michael R. (1991). Buddhist Studies in the People's Republic of China, 1990–1991. University of Hawaii Press. p. 141. ISBN 0-8248-1363-4. Findley, Carter Vaughnm, The Turks in World History, Oxford University Press: Oxford (2005). Holster, Charles Warren, The Turks of Central Asia Praeger: Westport, Connecticut (1993). 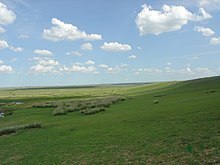 The Onoğurs or Oğurs, were Turkic nomadic equestrians who flourished in the Pontic-Caspian steppe and the Volga region between 5th and 7th century, and spoke Oğhuric language. The Ashina, also known as Asen, Asena, or Açina, were a tribe and the ruling dynasty of the ancient Turkic peoples. It rose to prominence in the mid-6th century when the leader, Bumin Qaghan, revolted against the Rouran Khaganate. The two main branches of the family, one descended from Bumin and the other from his brother Istämi, ruled over the eastern and western parts of the Göktürk confederation, respectively.